The Postmortem Adventures of a Fried-Brain Hippie! Who Killed Randy Ratphink? : The Postmortem Adventures of a Fried-Brain Hippie by Jerry Flu is a wildly unconventional karmic whodunit - a sort of astral film noir, as it would play if scripted by a fugitive beat poet with a chip on his shoulder, a bad case of wanderlust, and nothing to lose. Randy Ratphink from Rootworm, Illinois - our protagonist - wakes up in a void, realizes that he has been murdered and, in typical gumshoe fashion, replays the memories and events in his life, determined to learn the identity of his killer and settle the score. The resulting cinematic journey is a raucous, irreverent, madcap romp full of colorful characters, zippy dialogue, and enough pop-culture references to delight every hippie, geek, nerd, and fantasy junkie on the planet. In a saturated market where very little seems fresh or new, Jerry Flu’s Who Killed Randy Ratphink? : The Postmortem Adventures of a Fried-Brain Hippie is wildly inventive and quirkily ebullient - the proverbial “something different” for which persnickety savants have long been searching. Randy Ratphink is truly an Everyman for the disenfranchised: at long last, hippies have an antihero to call their own. Who Killed Randy Ratphink? is, therefore, cause to celebrate on many levels. As with any good mystery, the merest reference to the ending would only spoil the fun; suffice it to say that our hero Randy, with the help of a Yoda/Shakespeare hybrid psychopomp named Budd, completes his monomythic journey and discovers that endings - in death, as in life - are never what they seem. Who Killed Randy Ratphink? : The Postmortem Adventures of a Fried-Brain Hippie is an edgy, winning modern epic not to be missed. A rare and captivating story - absolutely delightful from the first word to the last. Who Killed Randy Ratphink? The Postmortem Adventures of a Fried-Brain Hippie! is written by Jerry Flu. After his untimely death, Randy Ratphink was on his way to the hereafter, but not before one last critical assignment. Randy was determined to solve his own murder before he was ready to cross over to the other side. Stuck between the mortal world and the great beyond, Randy switched into detective mode, hoping that by reviewing his memories he would solve the case. Just like any homicide detective, Randy started compiling his list of suspects, starting with the last person to see him alive - Mrs. Marguerite McGinty, a.k.a. Crazy Daisy. Crazy Daisy with whom he had shared some really interesting memories; from almost getting him arrested when they first met on a Caribbean cruise, surviving a double midair hijacking together, and a lot more not-so-glorious shared adventures. Join Randy on his final trip down Memory Lane as his mind works to solve his murder and also get a sneak peek into the beginning of his next journey. Have you ever wondered what happens after one dies? After your soul departs your body for the immortal world? Well, in Who Killed Randy Ratphink? The Postmortem Adventures of a Fried-Brain Hippie, Jerry Flu has some pretty hilarious ideas. The book combines a brilliant and one of a kind story line with a writing style that is guaranteed to keep you focused and eager as you wait for Randy to solve his own murder. Giving dead Randy a chance to narrate his own story in first person is both bizarre and very captivating, giving the story a special kind of charm. Who Killed Randy Ratphink is a truly intriguing mystery with a touch of humor and a bonus twist. Who Killed Randy Ratphink? by Jerry Flu has a promising start. The dead body of Randy Ratphink is hallucinating, leading to exclamations like the one reminiscent of French philosopher Descartes, "I stink, therefore I am." The dead body is in search of its killer; it metamorphoses into a cloud of thoughts and begins the search. On realizing that he was murdered, his aim is to find and square up with the murderer. His consultations, including a few with a known psychic graphologist adept at analyzing handwriting, take him many places. In his hunt, he sometimes gets caught on the wrong side of the law. He finally lands up with rather surprising developments connected with his murder, his search for the murderer, and the associates who joined him in his hunt. The initial ten percent of this book is a real page turner; I relished it again and again. The way Randy takes revenge on his school time big bully is a wise and entertaining move. This book is full of such fascinating descriptions, like the behavior of certain characters presented as ‘finger spelling expletives.’ However the presence of the most interesting part of its plot, a corpse’s search for its murderer, finds only scant mention, mainly at the beginning and end of the tale. Also, the end should have been made more engaging to match the superb start. Even so, this is a well narrated story with a plot capable of holding one's interest. Oh my gosh! That's what I thought when I finished reading the laugh-out-loud funny new book by debut novelist Jerry Flu, Who Killed Randy Ratphink? : The Postmortem Adventures of a Fried Brain Hippie. What the heck is a "fried brain adventure," a reader may ask. Well, it's what happened to our protagonist, Randy Ratphink, after he found himself not just dead, but murdered, and determined to solve that crime even from the afterlife. 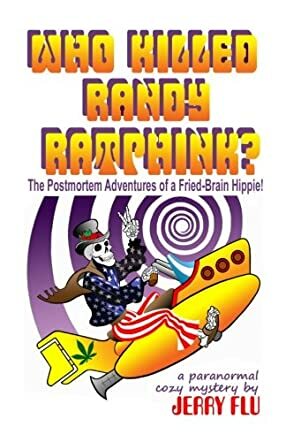 Randy, a not-so-former hippie while he was alive, is able to look back on flashes of his life, remembering folks from his hippie days all the way up to his death, trying to determine who had it in for him. And when he discovers who it is....well, I better let you read for yourself to find out what happens next. I so enjoyed Who Killed Randy Ratphink? Author Jerry Flu is a gentleman I would like to meet, his writing was so engaging and funny that I'd love to find out how his mind works in real life. He's done a fabulous job in creating characters, especially Randy, that are fun, funny and infectious. Once you start reading about them, you simply will not want to put the book down! In fact, the best piece of advice I have for readers, besides suggesting that they read this book, is to tell them to have enough time to read it through from start to finish when they pick it up; it's just that engrossing. I recommend Who Killed Randy Ratphink? : The Postmortem Adventures of a Fried Brain Hippie to any reader who loves humor, mysteries, or just a great read, and I will certainly be keeping my eye out for the next book by author Jerry Flu! If it's anything like this one, it will certainly be a must-read! Who Killed Randy Ratphink? – The Postmortem Adventures of a Fried Brain Hippie by Jerry Flu is a humorous story of life after death. Randy Ratphink wakes up dead, murdered, and now he can’t move on. Watching his life flash before him as he hovers in the in-between, Randy decides that he has to find out who killed him before he can move on. So, he takes a wander back through his memories to see if he can come up with any clues. He lists his suspects, starting with Crazy Daisy, the last person who saw him alive. But the discovery of who the murderer is comes as a huge surprise to him. So, who did kill Randy Ratphink? The only way to find out is to read the book. Who Killed Randy Ratphink? – The Postmortem Adventures of a Fried Brain Hippie by Jerry Flu was laugh out loud funny. Jerry Flu has a very creative mind and has come up with a hilarious insight into life after death. His characters, especially the main one, are extremely well developed and have a real depth to them. The storyline is unique, which makes a refreshing change and it is definitely well thought out. Jerry Flu has some interesting ideas and insights on what happens to a person after death and some very funny ones too. The book is written in the first person as well, which adds an even more interesting twist to it. All in all, this was a humorous whodunit with a bit of a twist at the end, a book I guarantee no reader will put down until they have finished it.